Our farm gets its power from traditional silicon solar panels. But I have long been interested in the idea of using tiny antennas that resonate at light frequencies to collect solar power using what are called rectennas. A rectenna is an antenna connected to a diode that “rectifies” alternating current into direct current. Making antennas half the size of a wavelength of light is a nanotechnology challenge, but several designs have been fabricated and tested in laboratories. The main reason for the excitement is that such a system can, in theory, reach efficiencies of 85%, compared to silicon efficiencies below 30%. One of the main problems in nanotechnology is building those tiny things. Especially in the huge numbers needed to coat a big solar panel. 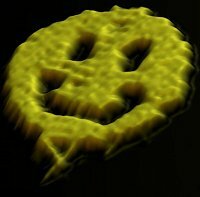 But new techniques in making tiny shapes out of DNA may come to the rescue. Paul Rothemund has been making things out of DNA for years, working on building computers out of DNA to solve difficult problems in computation. Researchers have already made DNA conductive like a metal, and made metallic arrays using DNA scaffolding. They have used ink-jet printers to paint surfaces with DNA. It seems to me that building tiny antennas and the low pass filters and MIM diodes needed for an optical rectenna is possible using DNA to form the parts, and coat them in regular arrays over large surfaces. The DNA would self-assemble the antennas into large thin-film crystals to convert sunlight into electricity. Categories: Chemistry, Environment, Genetics, Physics.